Cream-bordered Green Pea - Earias clorana (Linn.) A Personal Account of its Occurrence in Cornwall. Do you ever get the feeling you should be putting the moth trap out (because the weather is so good) but you're busy doing something else or its time for bed? In my case, the thought is often in the back of my mind that I will have to get up at five the next morning to cover the trap before the moths wake up and fly away or the birds get them... they soon learn don't they! So it was on the evening of the 26th July this year, after a spell of warm muggy weather spreading up from the south, my daughter Abigail reminded me that it was a good night for mothing and could we go out somewhere with the portable generator. I had to visit a friend first, so I piled the equipment in the boot and set off to Par before going onto St. Andrew's Pond for the mothing session. The next day I 'phoned Mark Tunmore but he was on holiday. I had to wait a week before he very kindly answered my 'phone message. I explained that I had found another breeding colony of the Cream-bordered Green Pea Earias clorana (Linn.) at Par Pond. He rather deflated me with his reply... "O yes, it's found in several places along the southern fringes of Cornwall. I've had it on the Lizard a few times. I'm sure it's breeding there," came his rather nonchalant reply. In case you are wondering what all the fuss is about and why I was so excited with the find, the answer goes way back to 1992. In those days Bill Kittle, my family and I, often visited Carlyon Bay (Crinnis Beach) to do a spot of trapping in case a few migrants turned up as they often did. It became a favourite spot simply because of the varied habitat and therefore the moths that are found there. (Spalding, A. The Moths at Carlyon Bay, Cornwall Recorded 1989-1993. British Journal of Entomology & Natural History vol. 8 1995 refers). Unfortunately the owners of the beach in recent years, have used the woodland to the rear as a camping area for several WOMAD music festivals and the repeated presence of thousands of people have in my opinion, somewhat spoiled the natural beauty of this site along with its flora and fauna. The site owners had extensively sprayed the area with herbicide and some areas had crucially been cleared of herbage where it is suspected E. clorana was breeding. To come back to the point, on the night of Saturday 13th June 1992 the weather was warm and close. There was no significant migrant activity apart from a solitary Pearly Underwing - Peridroma saucia (Hüb.) 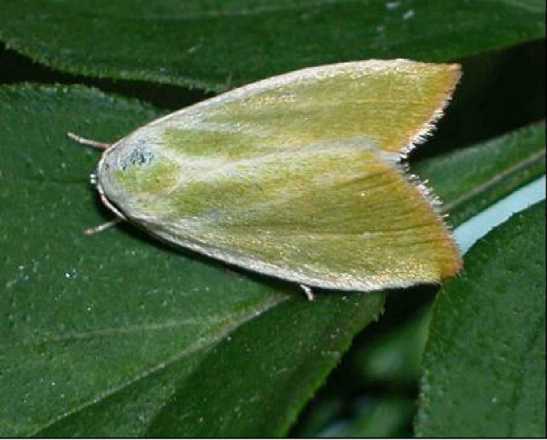 so to Bill Kittle's surprise, a small green moth seen on the sheet was identified almost immediately by him as Earias clorana, (Cream-bordered Green Pea) - a first for Cornwall. It was ab. flavimargo de Joannis, 1908 which has a rather yellowish termen. The specimen was exhibited in the British Entomological & Natural History Society's Annual Exhibition 1992 and erroneously described as Earias insulana - the Egyptian Bollworm - an extremely rare migrant/importation from Egypt where it is a serious pest on cotton. The forewings are similar to E.clorana ab. 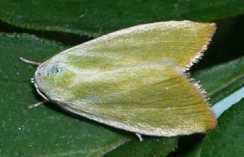 Flavimargo in colour having a yellowish apple-green appearance, however the wings are longer and narrower than E. clorana giving insulana a completely different look. An excellent description of the genus EARIAS (Hüb) by B. Goater can be found in the Entomologist's Record and Journal of Variation vol.106, Nos. 11 & 12, Nov/Dec.1994. Unfortunately the misidentification has been repeated since, thus compounding the error. The matter was finally corrected by J. D. Bradley in his Checklist of Lepidoptera Recorded from the British Isles 2nd edition (revised 2000) Comments on the 1998 edition by A. Spalding (Atropos vol.6 p.74). Well, if you have been patient enough to wade through the history of the occurrence of the moth in Cornwall and its misidentification, I'll come to the point. The moth has no doubt established itself by immigration probably dating from 1992 since ab. flavimargo is not known from native populations (Martin Honey personal comment). Hence the specimen found at mvl at Carlyon Bay was probably one of the first few specimens to arrive from abroad (possibly Brittany where ab. Flavimargo is known to occur) and from subsequent records in the ensuing years, it is assumed that it began to breed here. It occurred again on the 27th July 1996, when two came to light and the first indications of breeding were mooted. However close inspection of the flora at Carlyon Bay did not reveal its preferred food plant - Creeping Willow - Salix repens and Osier- Salix viminalis. Other species of willow are mentioned as a food plant but in my opinion, the caterpillar is simply feeding on Goat Willow (Sallow) - Salix caprea. A close inspection of the sallows in the vicinity of St. Andrews Pond, Par during this August may reveal the presence of the caterpillar during its final instar to confirm a newly established colony there. Other dates the moth has been found at Carlyon Bay are: 2nd August 1996 - a single specimen, 16th -18th July 1997 when ten were recorded and 23rd July 1997 when two were recorded. The late dates imply a second generation. Finally, from the female taken at St. Andrew's Pond, Par, eggs were obtained which were laid singly after four days captivity. Although Weeping Willow was present in the breeding cage, the moth preferred laying on the rough surface of some tissue wipes placed in the breeding cage. The colour rendering in the two photographs is not entirely accurate, the eggs having a browner appearance than the photos imply with a blacker concentric ring. The spherical eggs some 0.3mm in diameter, after turning a darker colour, failed to hatch after 17 days and I am inclined to think they are infertile or will not now hatch due to unknown adverse conditions. I would greatly welcome some advice on this matter. I leave you with some photographs of the eggs and adult. Cornwall. 26th July 2002 at mvl. Photo: P.H.Boggis. kitchen paper in breeding cage.